This week two new restaurants open along Georgetown’s posh M Street and hope to fill some of the gaps within the neighborhoods food scene. Opening on Thursday, the long time M Street Italian staple, News Cafe, re-brands and revamps its menu as Thunder Burger & Bar. According to Vox Populi’s exclusive interview with Thunder Burger & Bar’s GM Ryan Clarke, the establishment will offer “a fully rounded-out menu, but 95% of the focus will be on the burger.” Clarke hopes to differentiate the eatery from the plethora of DC burger places by bringing “quality burgers back to a sit-down restaurant with a sit-down experience.” Not quite sure this is a winning strategy, especially with all the other nearby restaurants that offer fantastic burgers (J. Paul’s, Clyde’s, Martin’s, Rugby, etc.) but it will definitely be an improvement from News Cafe. Further down the road at 3291 M Street, Georgetown Wing Co. has a soft opening this week, which features (not surprisingly) wings. The restaurant has a fantastic beer selection, because what goes better with wings than beer, and they’ll feature $1.50 Miller Lites and $3 Sam Adams Seasonal and Sierra Nevada bottles. According to their twitter profile, for Friday’s World Cup kick off, they’ll be expanding their menu to include Crêpe bunch, mimosa & draft specials. Nom. It is not possible to have a “fantastic beer selection” and simultaneously feature “$1.50 Miller Lites.” Those are mutually exclusive. @Chris K Hahahahahahaha Very true. Although I suppose you could consider that they have a fantastic beer selection, but that it doesn’t include el cheapo Miller Lite. Any idea if Georgetown Wing Co. is going to have a 25-cent wing night or something along those lines? 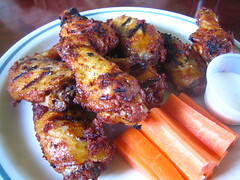 I was drawn to DC wing company with the hopes of finally finding a wide selection of big meaty spicey wings. When it was all said and done I was out 35 bucks and pissed off. I understand they are a new resturant and still have some kinks to work out but I came in for the promise of good wings and happy hour. Our waiter informed us that it was about five minutes until happy hour so we needed to wait till his manager got there at four before we could get happy hour. Fine I’ll wait five minutes for a beer, I know I’ve waited longer in Georgetown for a beer. So we ordered our wings. About 15 minutes later we were informed that because their manger hadn’t showed up we couldn’t get a beer. Never mind happy hour. We were not informed that we couldn’t get beers at all and even after complaining they made no attempt to rectify the situation. The management lied to us and after we complained told us “tough luck” and refused to try anything to help after a good 15 minutes of arguing with an incompetent manager. Generally just another poorly managed restaurant in Georgetown.